In opening, Critchley references Plato’s dialogue “Theaetetus,” suggesting that a philosopher is someone who looks “at the sky” or at things not grounded on/in earth and in doing so is unaware of the things at his feet (as Thales was when he was so intent on looking at the stars that he fell into a well). The philosopher, thus, is a joke. He adds that there are many layers in this water metaphor—one being that the water is Thales’ philosophers stone and that he therefore fell into his own philosophy. 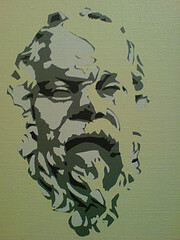 Socrates says that those in the constant press of business, like lawyers, policy-makers, mortgage brokers and hedge fund managers, become ‘bent and stunted’ and they are compelled ‘to do crooked things.’ The pettifogger is undoubtedly successful, wealthy and extraordinarily honey-tongued, but, Socrates adds, ‘small in his soul and shrewd and a shyster.’ The philosopher, by contrast, is free by virtue of his or her otherworldliness, by their capacity to fall into wells and appear silly. Further, the philosopher, according to Socrates, is unconcerned with the things of the polis—his body dwells within the city walls, but his thoughts are elsewhere. Ironically, of course, Crtichley reminds us that Socrates literally ran out of time in the courts and was sentenced to death, his words remaining only through the lens of Plato. So time is of the essence and is constantly in opposition to the philosopher—best friend and worst enemy. Critchley goes on to expound on the philosopher’s role as a gadfly and as a dissenter against the gods, for “nothing is more common in the history of philosophy than the accusation of impiety.” In this way, he proposes, “perhaps the last laugh is with the philosopher;” perhaps what society finds so uncanny and dissenting in philosophy is really what is needed—after all, isn’t this why we study ancient philosophy to this day?